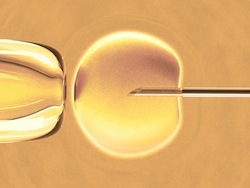 IVF and ICSI treatments are costly and time-consuming, so researchers are constantly looking for small details that can impact overall conception, pregnancy and live birth outcome. Researchers from the American University of Beirut Medical Center in Lebanon recently completed a tiny study on the impact of fever on follicular development and, potentially, IVF or ICSI outcome. There were only six women in the study. All women experienced poor ovarian response to gonadotropin stimulation cycles. All women reported illness with fever. After the following healthy cycle, researchers compared lab results from the two cycles with interesting results. The febrile cycle showed reduced preovulatory follicles and a higher number of medium follicles. Serum estradiol levels were significantly lower during the fevered cycle. Conclusion: In women having controlled ovarian stimulation, fever can impact the outcome of the cycle significantly. Development of follicles and production of estradiol were both significantly affected by the fever. Source: Awwad J, Ghazeeri G, Toth T, Hannoun A, Abou Abdallah M, Farra C. Fever in women may interfere with follicular development during controlled ovarian stimulation. Int J Hyperthermia. 2012 Oct 16.